Don’t get us wrong, we know that every guest is important to the success of your event. However, VIPs will need to come and go throughout the event, and it’s perfectly reasonable that they should have designated VIP transportation services available to them. This doesn’t just mean a private airport pickup, but also safe and reliable transportation for a night out on the town if needed. We’ll ensure that drivers are ready and available for your VIPs. Beyond our VIP transportation services, we also create extensive shuttle service plans to accommodate every single attendee. When you’re planning a convention that’s going to have tens of thousands of people, getting them where they need to be is absolutely essential. This includes designed airport transportation for before and after the event, along with golf cart shuttle service to move people quickly across the expansive convention venues. Lastly, but certainly not least, many companies that attend these events utilize available sponsorship opportunities such as shuttle wraps, headrest covers, and more! 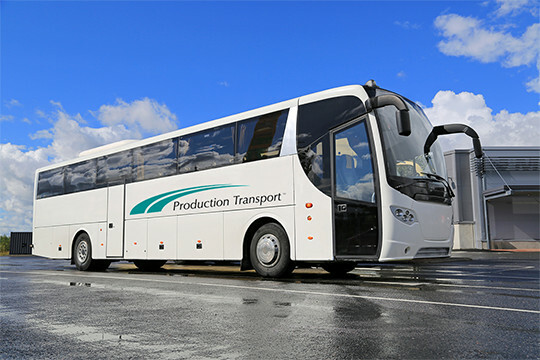 At Production Transport, we’ve spent more than 30 years developing the connections, expertise, and execution methods necessary to help convention organizers run some of the largest events throughout the United States and Canada. We typically start planning your transportation services at least a year in advance of any event, since there are so many logistics to cover. We go as far as to coordinate with the local department of transportation and the police department to ensure that routes are clear for seamless shuttle and VIP travel service.